Your lower preferences can NEVER, EVER be used against your higher preferences. If you mark a 4 opposite a candidate, this vote can only transfer after 1,2 and 3 on your list are either elected or eliminated. It can only be used to give a slight preference for the person you marked 4 against those you marked 5, 6 etc., never against your 1,2,3. To avoid spoiling your vote, don’t mark the same number twice. (two 1s on the paper will disqualify your vote. Two 2s will make it non-transferrable, etc.) An X can be counted as a 1, but better not to risk it – use numbers. Don’t write anything that could identify you on the paper – that will rule it out. For safety, better not to write any smart remarks on the paper at all – that’s what Facebook is for. Bring I.D. with you in case you are challenged. You don’t need a polling card, but bring it if you have it. The election itself is not going to +reverse the devastation to so many lives, particularly since the economic and social collapse of 2008. However, the strength of the parties negotiating a programme for government after the election, and the strong voices fro the opposition benches keeping poverty issues on the agenda, will make a difference to who benefits from the recovery (or who suffers for another downturn). A strategy which we can afford “… a five-year plan to bring overall Irish taxation levels from their current 30% of GDP to the EU average, which is currently 40% of GDP. We have tried to track the responses to the parties, which are given on the previous nine election blogs. Here are some pointers. What do the parties say about an anti-poverty strategy? The Anti-Austerity Alliance – People Before Profit do not specify the structures, but include policies throughout their manifesto(es) to redistribute resources to low and middle incomes. Fine Gael proposes a new Integrated Framework for Social Inclusion, built on our three pillars of i. More and Better Jobs; ii. Long Term Thinking for Better Services; iii. Equality of Opportunity. – help eliminate any persisting discrimination and draw on existing as well as new strategies. The Green Party calls for an approach that tackles the disease of poverty globally rather than the symptom of migration. Sinn Fein plan to fund the rollout of an area-based anti-poverty programme based on the Young Ballymun model. Is anyone talking about income and welfare? EAPN Ireland Policy Officer, in the second of these blogs Income and welfare – the forgotten debate?, lays out the issues and the manifesto proposals of the main parties. “Social welfare payments provide the vital safety net for those who cannot work. The welfare system plays a major role in providing a more equal distribution of income than the market would deliver, and in preventing individuals and families falling below the poverty line. “Ireland’s social welfare system has proven a more important lever than the tax system for redistributing income from the rich to the poor. ..Even in a period of low inflation, significant resources will be needed over the next five years just to maintain the real value of welfare payments. “In the Fine Gael, Labour and Sinn Féin manifestos there is a specific budget for social welfare, while in the Fianna Fáíl manifesto no budget is specified but a number of commitments are made to index certain benefits. “On a crude calculation it could require the best part of €2 billion to maintain the real value of welfare payments for five years. The highest planned allocation for welfare of €1.7 billion is set out in the Labour manifesto. Fine Gael allocates around €1.4 billion, and Sinn Féin €900 million. To balance this assessment, it should be noted that Sinn Fein proposes to reinstate the full rate of Jobseekers Allowance for under 26s, recognise the cost of disability by increasing Disability Allowance by €20 and raise the cut-off age of the One- Parent Family Payment to 12 years old. The AAA/PBP propose to reverse cuts to welfare rates and One Parent Family Payment. Al parties have a range of improvements to welfare in their manifestoes. See our blog Income and welfare – the forgotten debate? Renua wants to make welfare payments conditional on 20 hours’ community service. The EAPN Ireland blog Towards a ‘living wage’ – what does it mean and what are the parties saying? covers just what the title says, going into the manifestoes of the parties in some detail. ICTU have tracked the election debates in some detail, and they report on their special web page. They provide a list of candidates who have signed up to their charter on Fair Conditions at Work. Are they talking about homelessness? 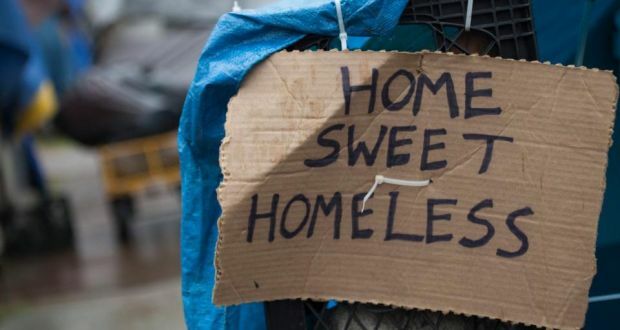 EAPN Ireland election blog No 8 looked at the positions of NGOs working for the homeless and how the issues are reflected in political parties’ manifestoes. This has been a big issue in the campaigns, for obvious and tragic reasons, and it will be important to se how this is reflected in the new programme for Government. How will we pay for decent income, services and jobs? Tax has been a big part of the election debate. Very few parties are explicitly calling for an increase in overall tax take to pay for services. The Social Democrats are calling for the current tax level to be maintained to allow for investment in services. AAA/PBP propose a range of new taxes on the rich and corporations while Renua proposes a flat tax on all income. The issue of abolition of USC (Fine Gael) or abolition on lower incomes (Fianna Fail and Labour) has been a big one in the election debates. Sinn Fein is proposing a wealth tax. Health, disability, childcare, communities etc., etc. This election has been tracked buy more interest groups than any other. EAPN Ireland Election Blog no. 3 lists a number of these, while Blog No 2 gives an overview from the point of view of the Community Platform’s Four Tests for the Next Government. And remember … It’s not over when the voting is finished. Keep the information you have gathered during the election campaign and remind your representatives of their commitments as the new Programme for Government is negotiated and as the new Dáil debates policies to end poverty. The struggle conti8nues until poverty is ended. We asked all of the party leaders to present their view on the issues which they will take up in Government or Opposition over the next ten years to fight poverty in Ireland. 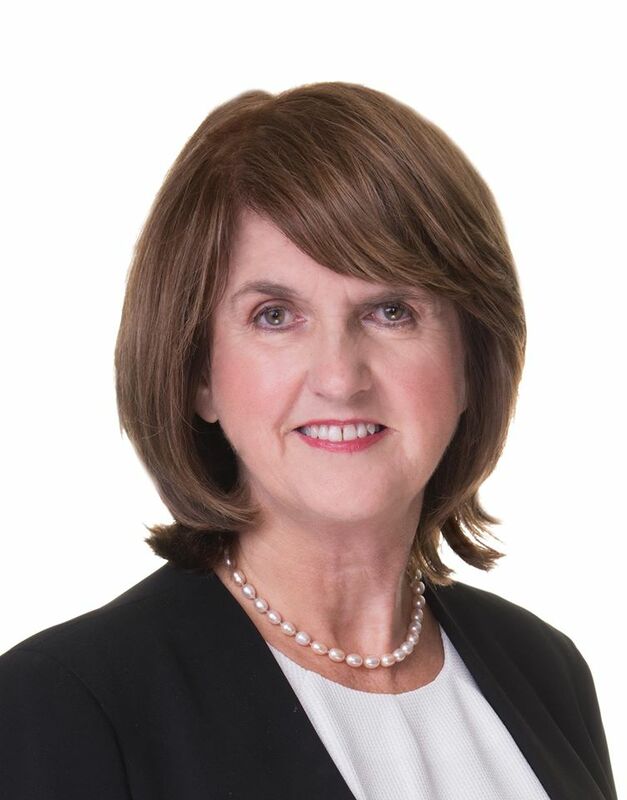 This is the third of the series, from an Tánaiste Joan Burton, leader of the Labour Party. Labour’s Manifesto Standing up for Ireland’s Future can be read here. The Labour Party’s focus in Government has been to build an Ireland of renewed prosperity, from the bottom up and middle out – rather than the top down. People’s economic rights are just as central as their social rights to living a complete and fulfilled life. The right to the best education we can provide. The right to a job with decent pay and conditions. The right to an affordable and secure home. The right to healthcare based on need, not wealth. The right to security of income in retirement. Labour in Government set about building the jobs-led recovery that is now under way. Throughout it all, we prioritised protecting the most vulnerable in society to the greatest possible extent. Other countries in similar economic difficulties slashed welfare rates. We maintained core weekly welfare rates, including the State pension. And we protected the welfare safety net when others wanted to reduce it. Official figures show that Ireland’s welfare system is the most effective in the EU at preventing poverty. The economic recovery is now under way and our mission is to ensure that recovery reaches everyone in society. We want to secure the recovery, to spread the benefits, and do so in a fair way that raises living standards and lowers inequality. We have increased the minimum wage by 20% to €9.15 per hour – about 48.5% of the estimated median wage. A challenging but achievable target would be to reach 60% of the median wage by 2021. This would imply a Minimum Wage of €11.30 in 2015 values. In achieving that, we will be transforming the Minimum Wage into a Living Wage, and making sure that work pays for all women. We secured the funding necessary to introduce a second year of free pre-school from next September, as well as a further increase to Child Benefit. And we will do much more if re-elected – we will substantially increase paid parental leave, and make childcare affordable for all families. Taken together, these measures will increase pay for women, and provide all women with the childcare necessary to allow them to participate in the workforce and benefit from that increased pay. We are determined to eradicate child poverty. We want to continue the progress made in recent years. The initiatives we are proposing will complement our proposals to introduce free GP care for all, to expand access to school meals, to introduce paid parental leave and high quality, affordable childcare, to eliminate long-term homelessness and to increase the minimum wage. Taken together, these measures will significantly reduce the number of children and young people living in poverty by 2021. In government, we have funded the introduction of Area-Based Childcare (ABC) programmes in areas of concentrated disadvantage such as Limerick, Ballymun and Tallaght. Rates of early school leaving have dropped below 10% for the first time. And we have increased funding for school meals. We will build on this work to end child poverty. We will produce a new National Action Plan for Social Inclusion in 2017, with the eradication of child poverty the primary objective of that action plan. 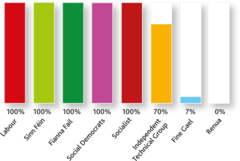 We will establish a new body – the End Child Poverty Commission to work to eradicate child poverty to make sure that we at least halve child poverty by 2021. In government, we have ensured that early school leaving has fallen below 10% for the first time. We have reformed the Junior Cert to put an end to young disadvantaged boys, in particular, disengaging from school. We have provided State funding to iScoil for those who have disengaged from school. And we have increased funding for school meals. We will increase the school leaving age to 17 to end a situation where one in ten drop out before getting a Leaving Cert. We will continue funding the ABC programmes and iScoil, and restore funding of School Completion Programmes to 2011 levels, and bring their governance and funding back within the education sector. Labour will rapidly expand the school meals programme, to ensure that no child goes hungry in school. We will identify the poorest schools in the country, in both urban and rural areas, and provide them with the funding, staffing and supports necessary to tackle deeply entrenched levels of disadvantage. A progressive vision based on vindicating people’s economic rights can – and will – lower inequality. That is Labour’s vision – and the recovery is now giving us the leeway to increase welfare payments in targeted areas such as Child Benefit and the Christmas Bonus, reduce taxes for low and middle-income workers, invest in public services such as free GP care for young children, and provide more teachers and facilities for our schools. EAPN Ireland’s Briefing on poverty and proposals for 2016-2021 calls for a strategy to end homelessness and ensure housing for all. “The strategy needs to increase the supply of housing to meet demand, so local authorities need to start building and providing social housing in a planned way to meet future needs. Approved Housing Bodies need to be recognised as providing housing and ease of access to finance needs to be available to them. “It must also provide adequate resources to fully implement a Housing First approach to homelessness. People need to move out of emergency accommodation as soon as possible and not become trapped in homelessness longer than is necessary. “Rent Supplement and Housing Assistance Payment must be increased to levels which meet market rents so that people can take up accommodation and avoid falling into homelessness. The related challenges of housing and homelessness have been prominent in public debate particularly over the last year. The specific challenges of addressing the accommodation crisis for Travellers has had less attention in the election debates, despite the public outcry over the Carrickmines tragedy. Most parties in the election acknowledge the need for more social housing and homeless services, while some support a referendum to enshrine the right to housing in the constitution. During one night in November 2015, there were 152 people without a safe place to sleep in Dublin City. This included 91 people sleeping rough and 61 people sheltering at the Nite Café (DRHE 2015). Unfortunately, Dublin is the only area where an official rough sleeper count takes place, making it difficult to get a countrywide rough sleeping picture. 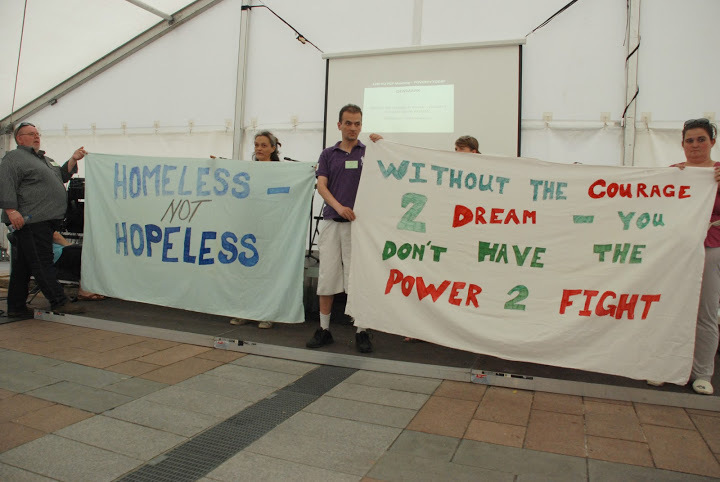 Figures from Cork Simon Community indicate that rough sleeping in Cork City increased seven-fold in three years (2011-2014). Comprehensive prevention and early intervention measures. Rapid rehousing using a Housing First approach. Access and priority for people who are homeless to affordable housing. If elected will you commit to ending long-term homelessness and the need to sleep rough and set a target date for achieving this? There is a record total of over 5,000 people homeless in Ireland. The vast majority are in emergency accommodation such as hostels or hotels with a small number sleeping rough. Will you commit (or lobby the Government) to build at least 40,000 social houses over the lifetime of the government? A record total of 100,000 households are on social housing waiting lists nationwide. That is one in every 16 households who are in need of social housing. Will you support holding a referendum on the ‘right to a home’ within the first three years of the next Government? Do you commit to ending family homelessness – what will you do to make this happen? There are over 1600 children in more than 700 families who are homeless in Ireland. Many are trapped in hotels or bed and breakfasts in one room with their children. Families are becoming homeless mostly for economic reasons. Many more households are also struggling to pay their rent or mortgage each month. Will you commit to ending the youth homelessness trap? Over 500 young people are trapped in emergency homeless accommodation, with a social welfare rate too low to provide them with a proper home and unable to get a job or training because they are homeless. Land, procurement and planning : local authorities to review their land banks and building stock to identify resources that could be used to deliver social housing. Housing provision: the 30% – 50% allocation rates for special needs groups in social housing to be maintained until such time as long term homelessness and the need to sleep rough is eliminated. Protecting and supporting children and young people. Investment and recruitment is required to ensure that every vulnerable child and young adult has, at a minimum, an allocated social worker and after care plan in place. Drug treatment services: a health focused approach to combating drug misuse in Ireland…introduction of medically supervised injecting centres in urban centres across Ireland.. Funding to develop a network of accommodation options for persons exiting treatment and detox services. An integrated approach, not a reactive and piecemeal one is needed. A strategic approach to address complex issues including financing, regulation, standards, and welfare supports, as well social and affordable rents. Reform to be able to attract long-term stable investment into the rented sector, especially from institutional investors. A clear framework will have a positive effect on the wider housing market and the economy in general. Incorporation of models that work in other countries that provide stability and affordability in the private rented sector. Transform NAMA into a vehicle to provide tens of thousands of social and affordable homes, using its massive resources. .
making decent, secure and affordable housing available to everyone – no one should ever be without decent, secure housing for economic reasons and no one should have to spend more than 10-15% of their income on housing. An immediate ban on economic evictions – change the law so landlords cannot sell or refurbish a property without the tenant’s consent. An immediate rent freeze and progressive rent reductions to affordable levels. A massive programme of direct construction of housing by local authorities to satisfy existing housing need and ensure adequate future supply. Acquiring suitable buy-to-let and other private rental properties to immediately increase supply of affordable rented accommodation. Build 50,000 council houses– 10,000 a year over 5 years. This will cost €3 billion in the first year and a total of €7 billion over 5 years, but it will become self-financing by year 6 and into the future. This programme will also provide jobs in the construction sector and add to revenue receipts. Transfer of 20,000 NAMA housing units to local authorities. Introduce immediate Rent Controls. Establish a new Rental Board that oversees rental prices according to transparent criteria. Reduce rents where they do not meet these criteria and limit rent increases to the rate of inflation. Give tenants security of tenure to protect them against homelessness. Create a special savings scheme to help first time buyers save for their deposit. Double housing output to 25,000 per year by 2020. Provide over 110,000 social housing units by 2020, through the delivery of 35,000 new units and meeting the housing needs of some 75,000 households through the Housing Assistance Payment (HAP) and Rental Accommodation Scheme (RAS). Review, in 2016, the disparate system of differentiated rents nationally to ensure that housing supports, including the HAP, are fair and sustainable, and prioritise those on the lowest incomes. Introduce a new scheme to help people who are insolvent, and in mortgage arrears on their home, to access independent expert financial and legal advice. improve the availability of finance for new home construction, with a €500m joint venture to finance the building of 11,000 new homes through the Ireland Strategic Investment Fund (ISIF). Continue to deal with the remaining unfinished housing developments. Work with housing associations to develop a cost rental option for low income families. Promote a better balance of rights and protections for tenants and landlords. Increase the Housing Adaptation grant scheme by a further 20% to €66m by 2021 so as to keep people in their homes. Implement a housing-focused strategy to end involuntary long-term homelessness. Affordable homes, a strong private rental sector and a social housing system based on a cost rental model as proposed by the National Economic and Social Council . Amalgamate the Housing Agency and the Housing Finance Agency to create the National Housing Authority, tasked with providing 7,500 units of social and affordable housing per annum. Further, this new authority would take the existing expertise developed within NAMA as that agency winds down. Replace property tax with a new tax levied annually at a progressive rate on the site value of lands suitable for building. Restore the Part (V) requirements to 20%. Limit the amount by which a landlord can raise rent in any year to 7%. Create an online portal to facilitate the transfer of social housing between tenants – ultimately handled by the local housing department. Audit local authorities’ delivery and implementation of Traveller accommodation plans. Continue to work to ensure the successful delivery of the Social Housing Strategy involving delivering 110,000 social housing units by 2020 at a cost of €4bn, and to enhance social housing delivery as resources and new supply channels become available. Regulation of the Approved Housing Bodies sector as a means to build capacity and further augment its ability to deliver housing. Provide €300m to develop an affordable rental housing sector. Invest €100m to support construction by local authorities and others of affordable housing projects with a further €200m to support rents in 44,000 affordable housing units. Build balanced, mixed tenure communities comprising different types of housing. End rough sleeping and implement a housing-led approach to homelessness. Provide houses as quickly as possible, including fastbuild homes, to take families out of emergency accommodation . local authorities will be supported to frontload the Part V contribution to part finance housing projects. establish a nationally integrated asset management system in conjunction with the local authorities in order to ensure more efficient management of social housing stock. As NAMA winds down its current operations, the agency take up a new remit as the Land Development Agency to ensure long-term housing demand is matched by available land. Extend the “Empty Nester” scheme that is available in parts of Dublin city and county. Establish a ‘Save to Buy’ scheme for aspiring home owners costing a maximum of €6,000 of saving over five years. Further reform the law to ensure a stable, sustainable rental market for both tenants and landlords. Ten billion Euro investment in community housing. Match existing public lands with private pension and investment funds to create mixed-tenure housing developments and improve the supply of accommodation in areas of high demand. 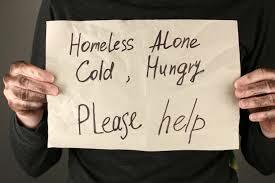 To address homelessness Local Authorities will be mandated to put an inter-agency plan in place to ensure a network of supports are made available to enable all those who want to live a full life are provided with avenues to achieve this goal. Build at least 70,000 social units and at least 30,000 cost purchase and cost rental housing units by 2030. .Strengthen Part V to ensure the delivery of 36,500 social and affordable houses. .review all property-related tax reliefs that encourage speculation for profit. Re-examine the practice of capping rent subsidies .introduce rent regulations, to ensure rents demanded by landlords do not escalate to meet any increase in the rent cap. .create rent certainty by linking rent increases to inflation. Legislate for Rent Certainty and secure occupancy. New retro-fitting home energy scheme. Establish a Local Authority Fund to enable more housing estates to be taken into charge. New Department of Housing Communities and Planning with a Minister at full Cabinet level. Rent Certainty, link rent increases in areas of high rental inflation to the cost of living. 10. Time to vote. Time to end poverty for good. Towards a ‘living wage’ – what does it mean and what are the parties saying? One of the pillars of the EAPN Ireland proposals for 2016 to 2021 “Towards a new anti-poverty strategy” is a strategy for quality jobs. As well as job creation and training strategies, this also means decent pay and conditions. This paper focusses mainly on pay, but it is important to remember that the key issue is to ensure that workers have an adequate take home pay. In the last section of this blog, we look at other issues which impact on this. EAPN Ireland was one of the group of organisations which campaigned for the restoration of the minimum wage level which was cut in 2009 and restored in 2011 by the new Government. This has since been increased again. We also support calls for a living wage, to ensure that work genuinely lifts people out of poverty. (for more background see EAPN Ireland Submission to the Low Pay Commission, 2015). The Irish Living Wage Technical Group calculates the current level needed to live a life with dignity at €11.50 per hour for a single person working full time. This is reviewed annually by the group, made up of the Vincentian Partnership for Social Justice (VPSJ), the Nevin Economic Research Institute (NERI), Social Justice Ireland, SIPTU, TASC think-tank and UNITE the Union. “unlike the National Minimum Wage which is not based on the cost of living. At European level, the EAPN Awareness Raising Action on Decent / Living Wages focusses on ensuring quality of work and employment for all those who are able to work, which has always been a cornerstone of EAPN’s action in the fight against poverty and social exclusion. “The question of adequacy of wages is a crucial one. Statutory minimum wage rates (which, according to Eurostat, exist in 22 out of 28 Member States) do not often come with a guarantee of providing income adequacy for all workers. The EAPN campaign page includes a useful background note on the Living Wage. “A Living Wage level will be distinct from a subsistence level, because it goes beyond a biological minimum and calculates a ‘low cost, but acceptable’ standard of living, which will cover housing and other incidentals, such as clothing and nutrition. In the UK and in some states of the US, the standard generally means that a person working full-time, with no additional income, should be able to afford more than the basics for quality of life, such as food, utilities, transport, health care, and minimal recreation, as well as one course a year to upgrade their education and childcare. Different states in the US use varying criteria for the calculation of the Living Wage. In the UK, a single methodology is used. 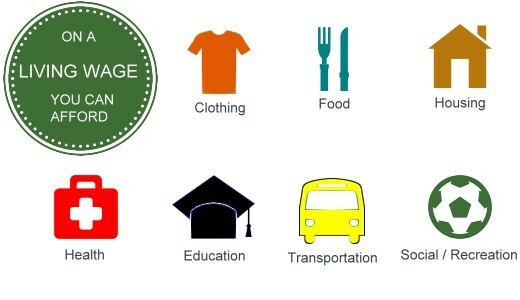 Its starting point is for members of the public to identify what items people need for a minimum acceptable standard of living. “A Living Wage is distinct from a National Minimum Wage, because the latter is set by law and typically in most countries has failed to meet the requirements to have a basic quality of life, leaving the employee to rely on Government programs for additional income. Minimum wages tend to reflect accommodations between employer interests and the State, reflecting a number of competing factors, including impact on the labour market, competitiveness etc, whereas a Living Wage should allow a human being in a civilized community to have a decent living estimated by current standards, irrespective of the employer’s willingness to pay. The target is to ensure a worker’s earnings are sufficient to meet a social norm of decency, rather than over reliance on welfare payments to supplement pay from work. The concept of a ‘living wage’ is also being used into negotiations over raising minimum wage level. “Negotiations between trade unions and employers, and in some cases public bodies, will continue to set wage rates for particular professions and sectors. In many cases, rates agreed will be higher that the Living Wage, reflecting economic value, skills, and other factors. 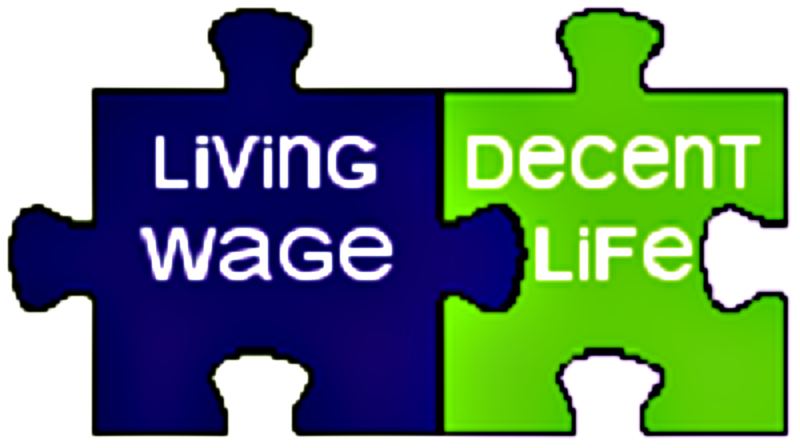 In sectors where some or all employees are paid less than the Living Wage, trade unions may wish to use the set Living Wage figure as a minimum bargaining demand, or to identify it as a future goal to be achieved incrementally, reflecting the realities of the bargaining process. “…A living wage affords an individual sufficient income to achieve an agreed, acceptable minimum standard of living, taking account of the need for food, clothing, heating, accommodation, transport and other essential costs. Currently, it is estimated that in order to earn a living income from full-time work -taking account of taxes and welfare – it would be necessary for a single adult to earn at least €11.50 per hour….” For more on the living wage, click here. The issue of a ‘living wage’ and the minimum wage has featured heavily in the campaign. Checking the main ‘headlines’ on the parties’ websites, we see that al have mentioned the issue. The Social Democrats propose to introduce a living wage, which is based on the real cost of living as envisioned by the Living Wage Campaign, in consultation with employers and based on affordability. Policy on minimum wages and living wages have to be understood in the broader context of policies to provide decent working conditions and making work pay. AAA/People Before Profit call for the abolition of JobBridge, Gateway, Jobpath, described as “exploitation of the unemployed” and their replacement with a Real-Jobs scheme based on proper education, apprenticeship schemes and public investment in jobs. Fine Gael proposes to replace Family Income Supplement for new entrants with a new Working Family Payment to ensure that every parent working 15 hours or more per week takes home at least €11.75 per hour. The Labour Party says it will end abusive terms and conditions of employment including zero hour and insecure contracts, low pay, casualisation, and enforced and bogus self-employment. It also says that anyone who works regular hours for a minimum period of 12 hours per week will be legally entitled to a written contract, and create better protection for workers who provide contracted services. Sinn Fein proposes introducing legislation that provides for fair hours contracts.
. and ensuring activation schemes are of high quality and support job creation by shutting down the JobBridge and Gateway schemes and making greater use of the JobsPlus and Community Employment Schemes, providing 1,000 additional apprenticeship places for trainees and 500 additional places on the Momentum scheme for jobseekers with disabilities and extending Community Employment to recognise it as a path to regular employment and also in recognition that community employment and services are ends in and of themselves. The Social Democrats also propose a ban on zero hour contracts, as well as addressing the prevalence of ‘if and when’ Contracts, extending the terms of reference of the Low Pay Commission to include a proper oversight framework for internships, low hours and precarious work in the wider economy, reforming Irish labour activation policy by ensuring schemes are better regulated and targeted for different groups with very distinct needs, providing far better information to jobseekers and scrapping JobBridge and introduce a new internship programme. 7. Towards a ‘living wage’ – what does it mean and what are the parties saying? 4. Income and welfare – the forgotten debate? This Blog is tracking debates and proposals through the election on how to tackle poverty. debates, interventions etc. as the election campaign goes on. 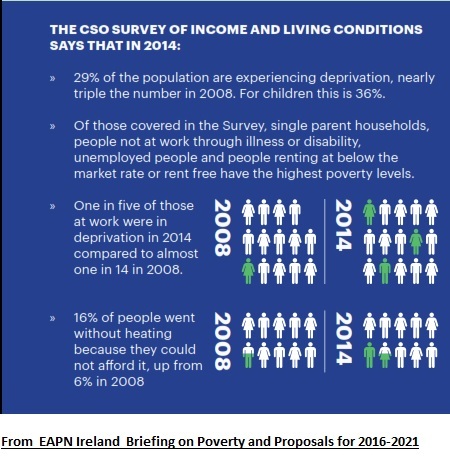 Our latest publication, the European Anti-Poverty Network Ireland Briefing on poverty, 2015 and proposals for 2016-2021, describes in some detail the extent of poverty in Ireland and the challenges faced by the next Government. We would also encourage you to print and use– Your free election door-hanger. 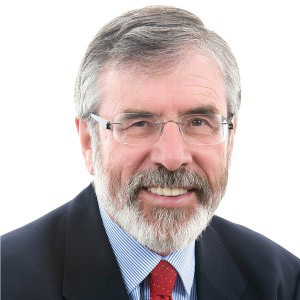 This is the second of the series, from Gerry Adams, leader of Sinn Fein. Sinn Fein’s policies can be read here and their manifesto, For a Fair Recovery, here. Poverty in the Irish state remains endemic. 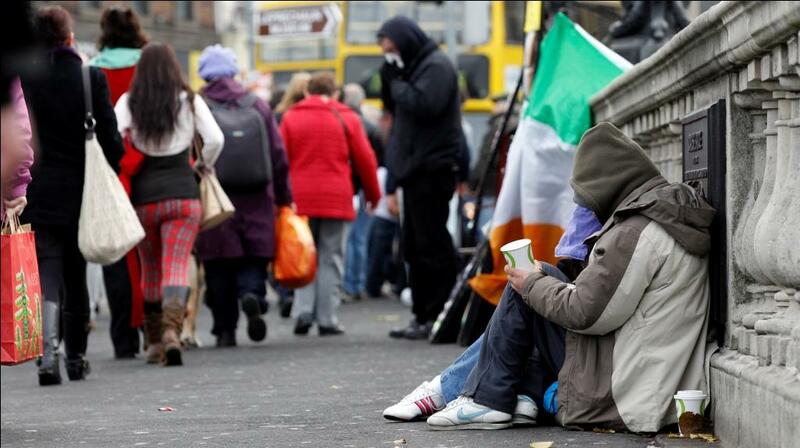 According to the European Anti-Poverty Network the percentage of Irish people living in consistent poverty in 2014 was 8%, up from 4.2% in 2008. More dramatically the consistent poverty rate for the unemployed in 2013 was 22.6%, up from 9.7% in 2008. Children remain the most vulnerable age group. Their plight gives an insight into a crisis that persists. Several weeks ago the Minister for Children James Reilly was questioned at the UN Committee on the Rights of the Child in Geneva on issues of poverty and disadvantage impacting on children. In the last 7 years the number of children living in consistent poverty has almost doubled. CSO figures for 2014 revealed that 11.2% of children live in consistent poverty. It is also estimated that one out of every three children is living in deprivation, while over a quarter of children at risk have no social worker. The homeless and housing crisis have also brought their share of hardship. As many as 3,000 children now live in hotel rooms or hostels. They are there either because they are homeless or because they are refugees. Two weeks ago an RTE report into families living in hotels provided an insight into the hardship they face and the difficulties confronting children. Behind the statistics are stories of real families and real children living in appalling conditions, often cold or hungry, and with little hope for the future. The general election provides an opportunity to chart a different course in the fight against poverty. Any anti-poverty strategy by the next government requires two broad approaches. Firstly it must repair the damage inflicted on our income security system by its predecessors, invest in public services and promote the rights of workers. Secondly, it has to put in place safeguards to ensure that children, lone parents, people with disabilities and other low income groups are not left vulnerable to cuts into the future. Serious efforts have been made by government parties to spin a line that ‘core’ welfare rates and the vulnerable were protected during the recession. But the truth is that all income is ‘core’ to a low income household and not a house in the state that is dependent on social welfare has escaped unscathed from the cuts inflicted by the Fine Gael/Labour Party government and by Fianna Fáil and the Green Party before them. Fine Gael, and to its shame Labour, actively cut and undermined the incomes of households depending on social welfare and those of low income working families alike. They did so directly by cutting social welfare schemes and payments and indirectly by unleashing thousands of free workers into the labour market via JobBridge. The first time a Labour Party in government ever codified work for no pay. As part of a strategy to fight poverty over five years in government Sinn Féin would target over €900 million in social welfare increases at those groups who are evidently most in need. This would mean restoring equality for young jobseekers by reinstating full rates of jobseekers allowance for the under 26s; recognising the cost of disability by increasing disability allowance by €20; increasing Fuel Allowance; Family Income Supplement and the Back to School Allowance; raising the cut-off age of the One Parent Family Payment to 12 years old, and increasing its earnings disregard to €120. Sinn Féin would also ensure activation schemes are of high quality and support job creation by closing down the JobBridge and Gateway schemes and making greater use of the JobsPlus and Community Employment Schemes. Sinn Féin would legislate to establish a Social Protection Adequacy Commission. The principle function of the Commission would be to examine the minimum income required by different household types in receipt of social welfare to secure a Minimum Essential Standard of Living and make associated recommendations for adjustments to social welfare rates of payment to the Minister on an annual basis. Sinn Féin is determined to create jobs – but the right kind of jobs; long-term, sustainable, decent paying and union recognising jobs. Support the introduction of a Living Wage, and as a first step make the public sector a Living Wage employer. Deal with the uncertainty created by insecure and low hour contracts by introducing legislation that provides for Fair Hours contracts. Strengthen compliance and enforcement of employment and workers’ rights both in legislation and resourcing of the Workplace Relations Commission Inspection Services. Tackling poverty isn’t just about putting cash in people’s pockets it requires a whole of government approach. The priorities in our manifesto reflect the comprehensive policy documents we’ve produced over the last couple of months. Sinn Féin has long advocated for the introduction of ‘Equality Budgeting’ by Government to reduce the inequalities of government policy outcomes. We want to see the introduction of Equality Impact Assessments of Government’s expenditure and taxation policy and we propose to establish an independent Equality and Budgetary Advisory Body underpinned by legislation as a necessary action to secure equality of outcome for citizens and a progressive addition to the budgetary framework. These are some of our proposals. There are others and we are willing to discuss what additional steps might be necessary. But one thing is certain doing nothing is not an option for those enduring poverty.